Epic Games granted us a huge wish and released Epic Citadel for Android devices publicly this week, and included a benchmark inside. Getting Epic Citadel for Android and thus a benchmark of a real game engine (Unreal Engine 3) running atop Android has been a longtime wish, and we immediately started testing some devices. Epic claims to have updated visuals for the Android Epic Citadel release, and correspondingly released an update for the iOS version, although the iOS version still lacks a benchmarking mode. The visuals inside Epic Citadel are impressive, which almost goes without saying. Performance walking around the map is also smooth, almost too smooth. I suspect Epic spent a lot of time optimizing the Android version for optimal performance on a wide set of hardware. Keep in mind that Epic Citadel is designed more as a proof of concept for developers, and to prove that Unreal Engine 3 can be performant across a wide range of hardware. 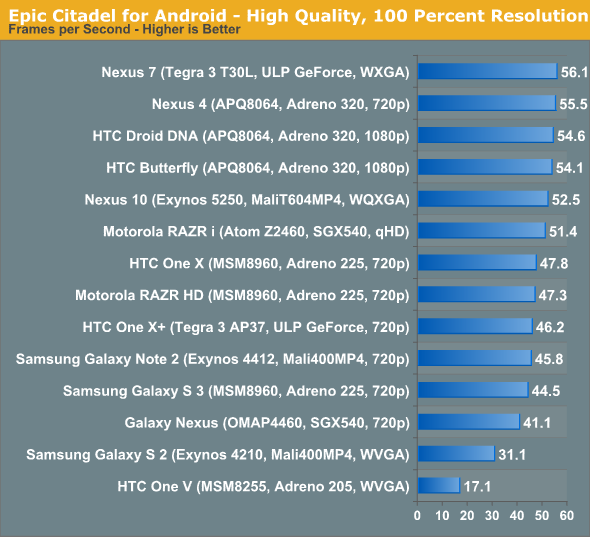 The Android version of Epic Citadel includes support for both ARM devices and x86, which lets us test it out on Intel's Medfield platform with a RAZR i in a native way alongside a suite of other Android devices. I grabbed a handful of current devices and N-1 generation devices to see how effective of a benchmark Epic Citadel's new mode proves to be. There's a menu option exposed by the drop down, which allows users to select between High Quality and High Performance modes, and below it, rendering resolution percentages if you want to set a render target smaller than the display (for example how the iPad with Retina Display initially rendered). To make the test as taxing as possible I set High Quality even on devices which defaulted to High Performance, and made sure resolution was set to 100% of native. Unfortunately Epic Citadel for Android is already running at vsync on most modern devices most of the time. Watching a run through on devices like the HTC Droid DNA or Butterfly, which are 1080p, it's amazing how much of the benchmark is right against vsync. There really is only one outdoor scene that is taxing enough to bring the device's FPS down into the low 50s and high 40s, which brings that average down below 60. If we're already at vsync on Fusion 3 hardware which is shipping today, that means future devices are going to be even more constrained running the same benchmark. Even Nexus 10 spends much of its time against vsync despite rendering to a positively huge WQXGA display natively. My conclusion is really that either Epic waited too long to release Epic Citadel with a benchmark, and now the assets are nowhere near taxing enough, or this is primarily designed as a benchmarking mode to showcase how well UE3 runs on current hardware. Given the purpose of Epic Citadel, I'd say the latter is more of a credible story. While I'm glad we finally have a proper UE3 benchmark to use on Android, I doubt we'll be able to glean much from running it on next-generation devices and SoCs. I forgot to include Galaxy Nexus, that'll be up shortly. I'd like to see rooted devices and their scores. Keep the CPU/GPU clocks the same... I'm just curios if theres a difference. then overclock and see if it helps.